An Awesome Long Weekend in Snowshoe, WV! Fast forward a week and were on our way! Our journey started from our house in Amherst, OH (about 35 miles west of Cleveland). The drive was a little over 6 hours... we opted for the quickest route which is mostly turnpike and freeway driving. If we were staying longer, we might have opted for a more scenic route. An item to note once you get to the base of the mountain… there are 2 roads up the mountain and both are totally fine. The GPS might just detect one… we skipped the first entrance we saw and followed the GPS instructions which added about 10 extra minutes of driving. Snowshoe is a beautiful little resort village on the top of Cheat Mountain. 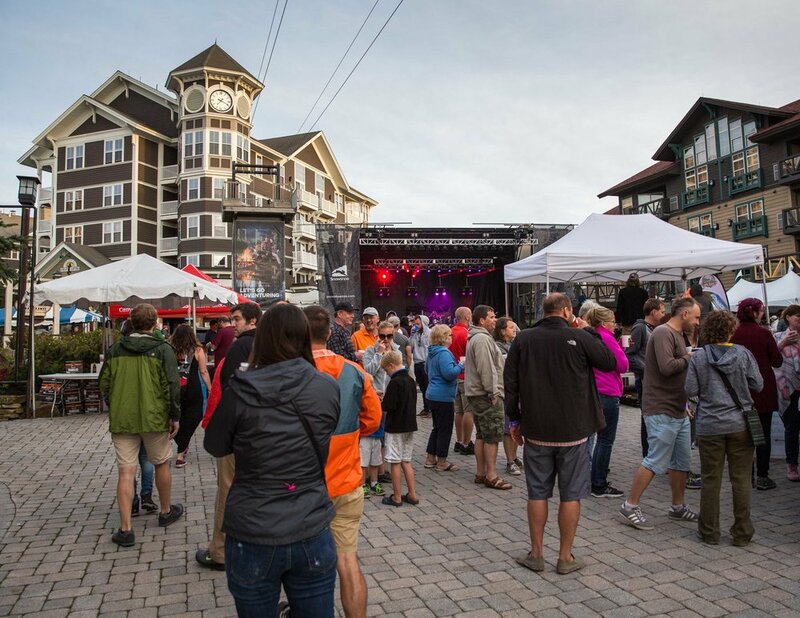 Restaurants, shops, and lodging surround the village square, which is the heart of the action. The atmosphere is lively, welcoming, and very family friendly. We stayed at the Allegheny Springs hotel, which is in the village. There lots of lodging options and some aren’t in the village… the lodging sprawls out about a mile each way along the mountain ridge, so it’s important to pay attention to the location when booking. We chose Allegheny Springs because of the location and room amenities. Our room included a bathroom, full kitchen, dining table, couch, 2 queen beds, and a balcony. For 2 nights with all taxes and fees included the total price was $500, and this included a lot more than just the room… access to all of the concerts and we each got passes for our full stay to almost all of the available activities which I describe in more detail below. There were lots of other lodging options… some more expensive and some less expensive. We estimate that we could have found a room for as low as $350 for 2 nights. 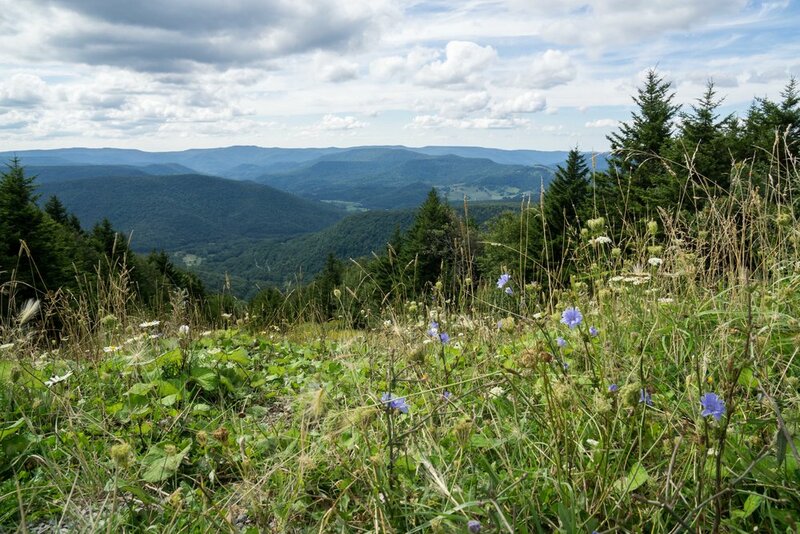 Though Snowshoe is a ski destination, there is a lot to do at Snowshoe in the summer! 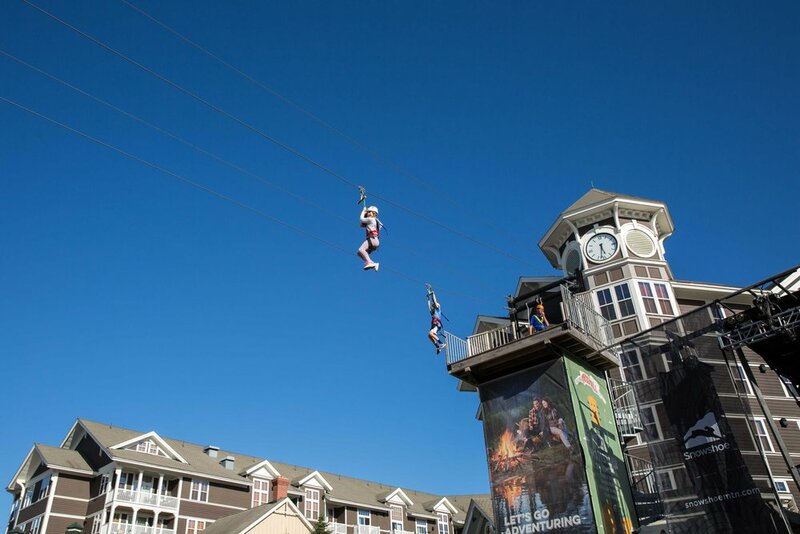 There’s a zip line through the village, climbing wall, Eruobungy trampoline, and “slack lines”. This was the first time we encountered slack lines, which are flexible lines for balancing… imagine a 2-inch wide rubber band to walk across! Some are set up for kids and beginners, and others are for more advanced slack liners. Daniel had a blast trying them out. 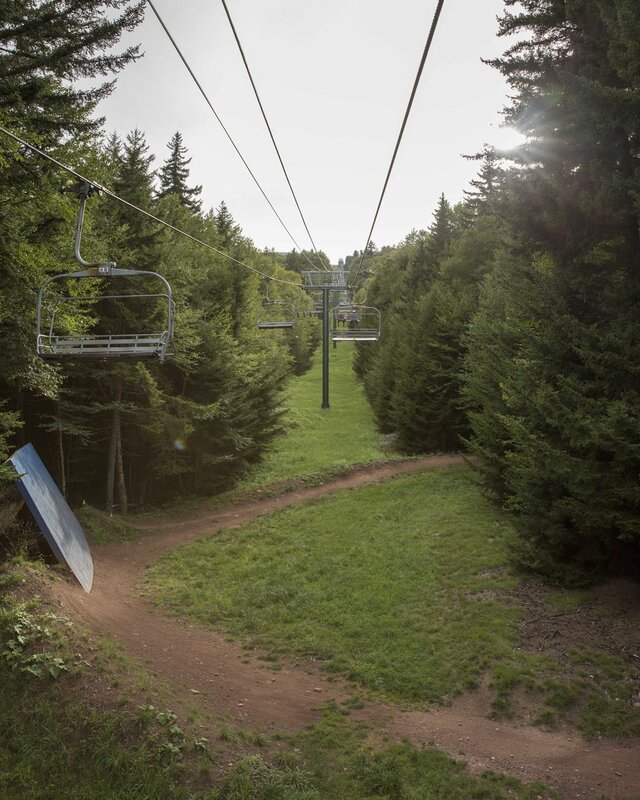 Biking is a big deal at Snowshoe in the summer… the ski trails are used as bike trails and some of the ski lifts are converted to bike lifts so bikers can bike down the mountain and take the lift back up. 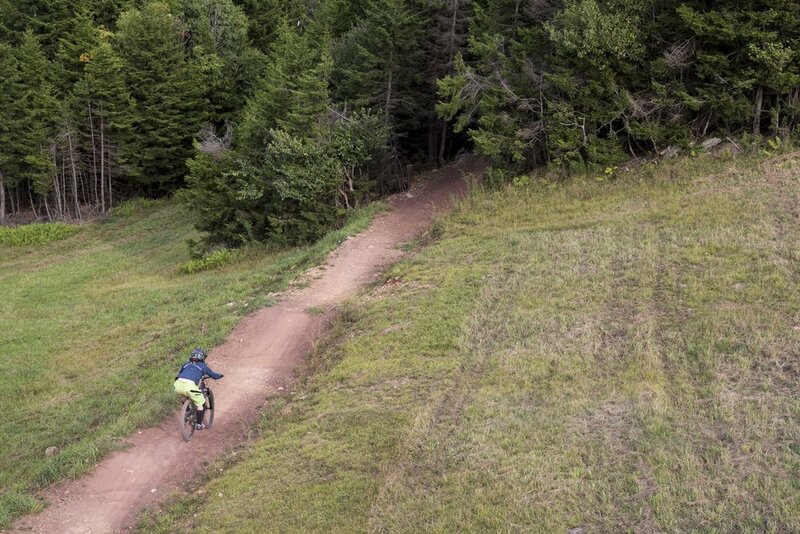 There’s also a little bike park at the base of the mountain for younger bikers. On Saturday we had an unexpected treat… a BMX bike show in the afternoon. Daniel had never seen a bike show and loved seeing the tricks. Interested in swimming? There are multiple options. Some of the hotels, including Allegheny Springs, have heated outdoor pools. Split Rocks pool is available for guests and includes both indoor and outdoor pools with slides. 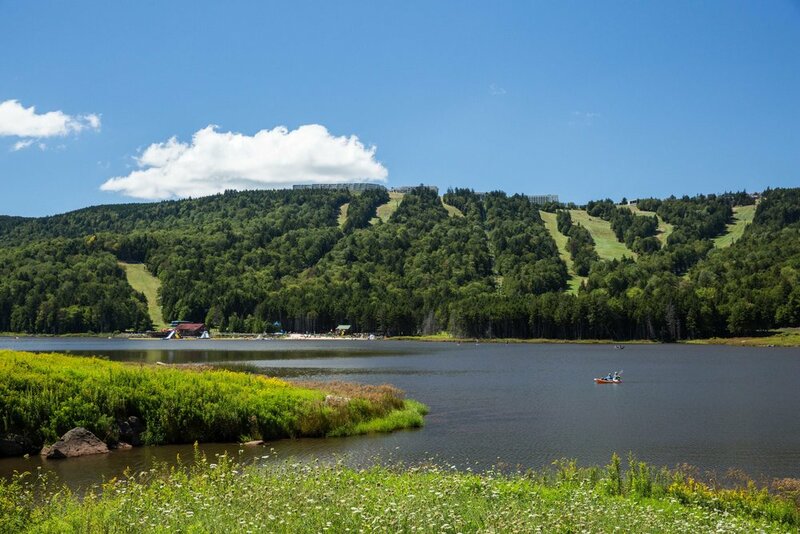 There’s also a lake in the valley at the base of the ski lift with a nice beach, swimming area, 2 playgrounds, and a bar and snack shack that’s open during the day on the weekends. Kayaks, stand-up paddle boards, and canoes are also available. We didn’t spend a lot of time in the lake area, but Daniel enjoyed taking the ski lift up and down a few times! We love hiking and on Saturday morning we did a fantastic 6-mile hike on the mountain ridge and down the mountain to the lake. We took a shuttle to the trailhead which is about 1.5 miles from the village. When we got to the lake we took the lift back up to the village. The majority of the trail is quite easy… not a lot of inclines/declines and a wide gravel walkway. However, the “Bail Out” trail that goes down the mountain is through the woods… downhill and lots of roots and rocks to navigate. It may not be a good choice for people with knee and hip issues. Lots to do, right? And I haven’t even talked about the reason for our trip – the music! What an awesome venue for live music… the stage was set up in the village square and 5 different bands played between Friday night and Saturday. Besides being great for music enjoyment, it was totally kid appropriate... there were lots of families and kids of all ages. At no point were we were uncomfortable with crowd behavior, language, etc. 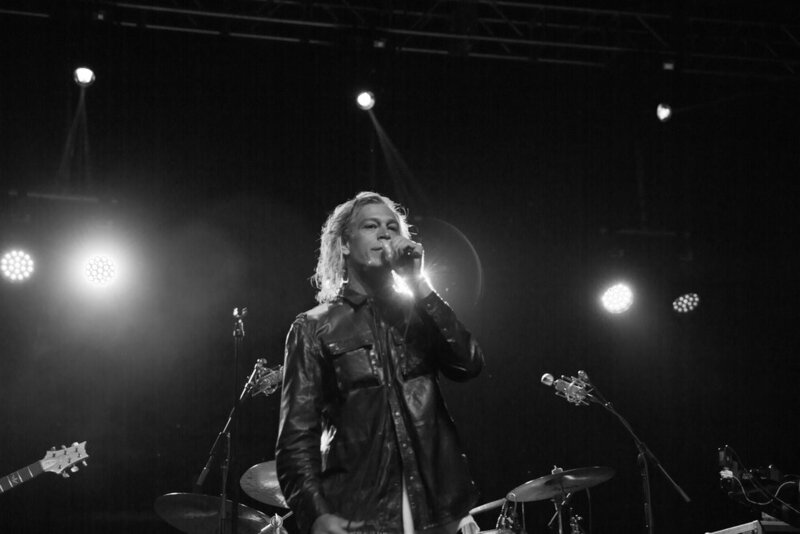 Matisyahu was the reason we planned the trip and he was AWESOME. Seeing him live is what “live” music is all about. He and his band are amazing musicians and improvise through the performance. If you’re looking to go to a show and hear exactly what you hear on an album, this is not the show for you. 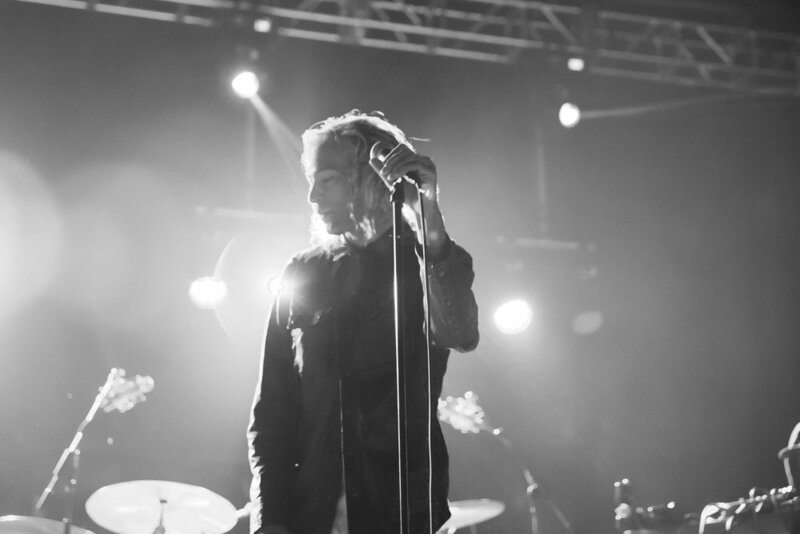 Matisyahu and his band do a different show each night… the emotion and musicianship are amazing. I could go on and on… I’ll do another post about gaining inspiration from live music! 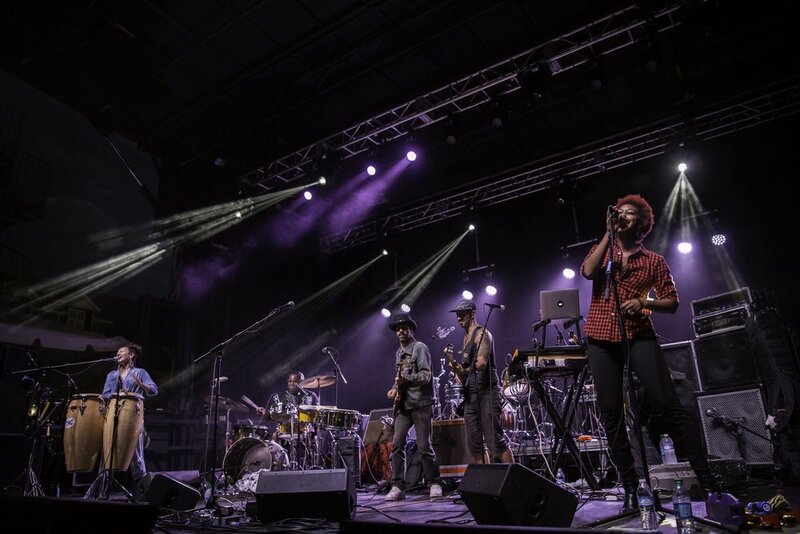 We found a new band that we LOVE… Pimps of Joytime. They are super funky, high energy, and have great lyrics. One of our new favorite songs is Freedom Dancer… it will surely be one of my weekly music picks! Before I talk about the food, I want to note that everything mentioned above was included in our room rate (other than downhill biking which requires a separate permit). We could also have played a couple rounds of golf at the the course at the base of the mountain. 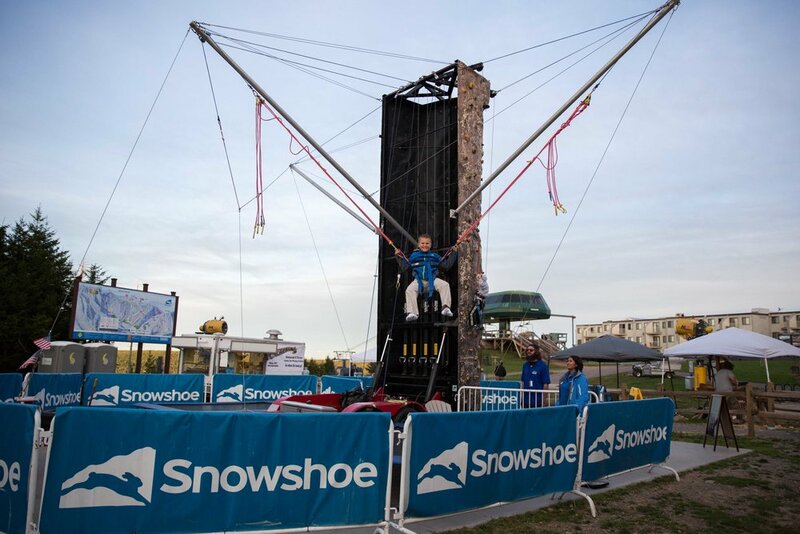 Day passes are available for $30/person for anyone not staying at one of the Snowshoe hotels. 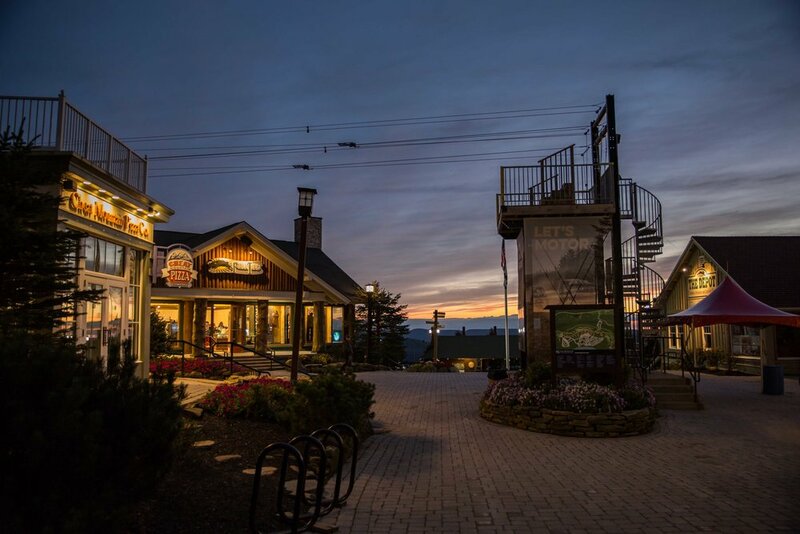 Snowshoe offers a number of dining options both in and out of the village. We packed food for some of our meals and went to restaurants for two dinners and one breakfast. We had dinner at The Junction and Cheat Mountain Pizza. The Junction has a number of salad, sandwich, and entrée options. It’s casual and the food is good. We really enjoyed Cheat Mountain Pizza… the pizza was great and our Greek salad was really fresh and tasty. Before heading home on Sunday morning we went to The Junction for breakfast. Todd and I enjoyed veggie omlettes and Daniel loved his cheese and bacon sandwich. If you’re interested in planning a visit to Snowshoe, one word of caution… pay very close attention to the season and what’s open. During the spring, summer, and early fall months the schedule is very limited during the week. We visited Snowshoe a couple years ago from Sunday – Wednesday, and on Tuesday and Wednesday almost everything was closed! We noted that the website has been updated to include a lot more information about days and times venues are open than the last time we visited. Our conclusion… Snowshoe is a great long weekend trip from the Cleveland area and the music festival was awesome! 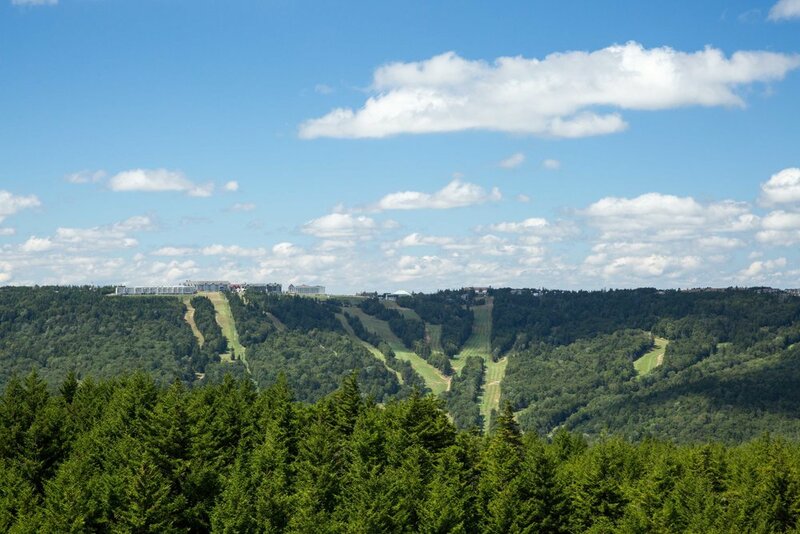 We’ll be on the lookout for events at Snowshoe next summer! Newer PostHocking Hills... A Fantastic Fall Quick Trip!! Older PostFrankenmuth... Michigan's Little Bavaria!